We are now Official Community Partner of #tiajkt2016! Dapatkan diskon 20% khusus untuk anggota Komunitas Mozilla Indonesia dengan kode tiajktmzindo20. Kunjungi situs resmi Tech in Asia Jakarta 2016 untuk pembelian tiket dan informasi lebih lanjut tentang agenda. I've been very lucky to be invited by Mozilla to attend their annual conference (Mozilla All Hands) this year in London. 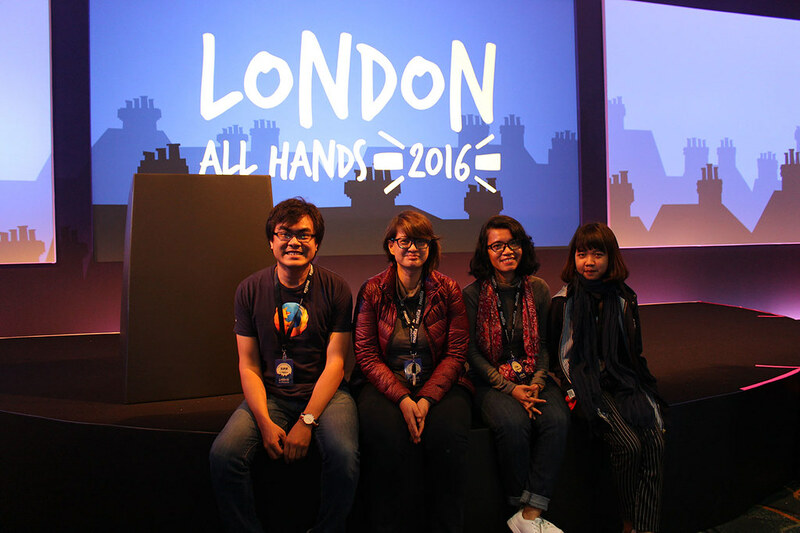 Mozilla All Hands London was held from 13 until 17 June 2016 in 3 different location, which is�Hilton London Paddington, Hilton London Metropole, and The Landmark. And this time, I was invited by the Marketing team to work closely with Support Mozilla team. There are also many lessons & intriguing information that I got from this event. Some of them are news update from Marketing team & some interesting project from Mozilla dev team. This year, Mozilla is constantly changing and revamping its various division. One that happen in Marketing team is to open the opportunity for volunteer to take part in Marketing activities, says like social media. There is also a program called Mozilla Open Design that was initiated to invite volunteers to take part in the process of rebrand the new identity of Mozilla. Rust is a modern programming language that the development are being sponsored by Mozilla. Although its development is sponsored by Mozilla, it is an open community project. In Indonesia itself, I think not much people know this programming language. However, from the Rust Training session that I join in MozLondon, Rust actually has some interesting features that is intereting to learn more. For you who interested to learn Rust, you can go to its website and documentation here. If Rust is a programming language, Servo is the product of Rust. Servo is the latest web engine that developed by Mozilla, in collaboration with Samsung. Because Servo showing a significantly better speed than Gecko, many people says that Servo will be the strongest candidate to replate Mozilla Firefox's current engine, Gecko. Let's just look for the next update! MozVR is Mozilla's initiative to bring virtual reality technology into the open web. One project that they being developed by MozVR is A-frame. A-frame itself is an open-source framework for creating 3D and virtual reality experiences on the web. It was a tiring yet inspiring week because this is such a new experience for me. I hope with this new experience, I will not only be a better contributor, but also can inspire more people to contribute to Mozilla. Mozilla Festival, Come with an Idea, Leave with a Community! Finally, i can attend the big Mozilla event, which is Mozilla Festival that taken place in Ravensbourne College, London, 6-8 November 2015. Yes i really been there with the invitation from Mozilla Participation Team as one of the Participation Leader from Indonesia. I attended the Mozilla global event such as Mozilla Camp in Kuala Lumpur and Singapore. And also the Mozilla Summit in Brussels Belgium. But Mozilla Festival is very much different from those events. Mozilla Festival is an open event that invites all people who interested to learn more about the web technologies, to attend and learn together. Beberapa hari yang lalu sebuah kabar mengejutkan tiba di inbox email saya. Sepucuk email yang menyatakan bahwa AdaCamp, sebuah acara yang diselenggarakan untuk meningkatkan partisipasi perempuan dalam teknologi terbuka dan kebudayaan (open technology and culture), tidak akan diselenggarakan lagi, setelah selama tiga tahun (2012-2014) diselenggarakan sekurangnya dua kali berturut-turut.